Ok, ok, I know this is going to be sexist but I find it hard enough to control one woman far less half a dozen! We've had a great couple of weeks and much has been accomplished but oh me, the noise an enthused group of ladies can make! This week one of them (ok it was Joan) asked me to through to the main part of the lab and instill some control - a fruitless task. One of the guys seemed to be more than happy to be in another section of the lab on his own - I cant imagine why. To be serious for a moment we got an awful lot done today and thanks to everyone for that. I suppose it just shows what fun you can have folding invitation cards, stuffing them in envelopes and then trying to come up with a list of invitees. Strangely the people finishing off dry mounting of photographs were much quieter (there was only one woman in that team). All this is for our next exhibition - High Street History - an exhibition of memories. The exhibition launches next Sunday (6th July) to celebrate the launch of Sunday opening at the Museum. The Friends membership will get invited, some vips and (most) of the local shopkeepers. Readers of this blog will be especially welcome. 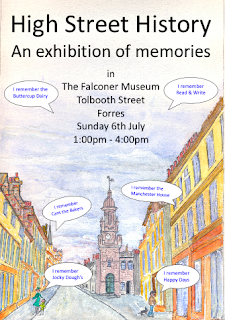 The exhibition brings together reminiscences in the form of over 70 speech balloons which will be displayed throughout both floors of the museum and also photographs taken from the collections of well known late Forres photographers Alec Fraser and David Forrester. 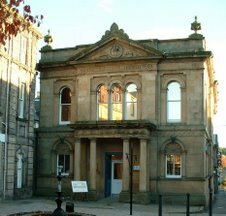 The five foot plan of the High Street as it was in the 1940s will also be on display and visitors will be encouraged to leave more reminiscences and also comments and recollections on the photographs. There will also be a case of artefacts relating to the High Street from the 1900s. The exhibition will run from Sunday 6th July - Friday 15th August. Opening hours are Monday to Saturday 10:00am - 6:00pm, Sunday 1:00pm - 4:00pm.